a) Fill out the form below to find out! b) If it says you're eligible, check the contract to be sure you meet all eligibility requirements! NOTE: The form below is not the application, just a form for checking your category. Still not sure if you qualify? Check here! Check the chart to determine eligibility. Example: I live in Sparta and am currently 16 and a junior, I enter my senior year in the fall and would be 17 by next July 31st. I would qualify for Miss Sparta based on the 4th white row. The Miss America Organization's contestant age eligibility requirements are based on a calendar year, not a pageant cycle. In order to be eligible to compete in a local or state competition, a contestant cannot be older than twenty-four (24) years of age on December 31st the year she could be chosen to represent her state in the National Finals. (1) Eligible if the contestant reaches 13 years of age by the first day of the following year's Miss Wisconsin's Outstanding Teen competition. 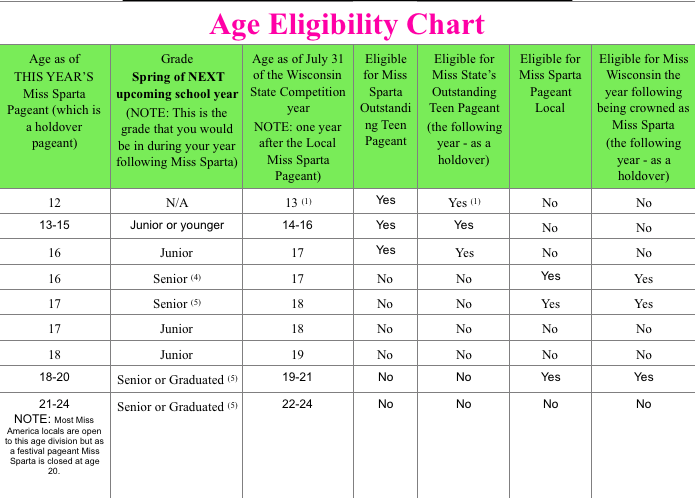 (2) This chart represents eligibility based on a potential contestant's Age and Education. There are other eligibility requirements and rules including: Residency, Citizenship, Other Personal Characteristics, Contractual and Other Obligations, and any special requirements of the Local or State Organization. Refer to the current MAOTeen Application and Contract for Local and State Pageants for more detailed requirements. (3) The last day that a local Miss pageant may be conducted in the State. (4) In this case the contestant could also be a high school graduate or have received her G.E.D. (5) In this case the contestant must graduate from high school or receive her G.E.D. by the end of the Spring of the state competition year.